”Let no one steal your dreams, Let no one tear apart, the burning ambition that fires the drive inside your heart. Let no one steal your dreams…Let no one tell you that you can’t. Let no one hold you back. Let no one tell you that you won’t. Set your sights and keep them fixed. Set your sights on high. Let no one steal your dreams. Your only limits is the sky. Let no one steal your dreams. 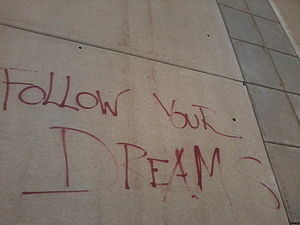 Follow your heart. Follow your soul. For only when you follow them, will you truly feel whole. No truer words well written, ponder on this folks! Your post of Cookson’s quotation is excellent. What a good time to remind people about holding onto dreams and working to make them come true. Dreams could be lost in a heartbeat. This is an excellent article which gears one to dream and persevere until realising one’s potentials. Yes, thanks for posting this, Seyi! Inspirational words in a time when some of us REALLY need them. I’m reminded of so many other works and writers whose message is keep pushing, keep fighting, it all matters! Thanks for reading and commenting! I’m glad it meant something to you. Life’s too short to quit halfway. Have a brilliant week ahead.